Hung or Balanced ? Deerhound or Bulldog ? We’ve slipped a bit here at Rogue HQ - so busy in the glen you know - but with websites, blogspots, flikr n youtube throwing up Scottish Deerhounds at every turn - I’m sure there’s been enough to keep everybody entertained - without the need for us to be around - but just to let you all know, we’ve got a bowl full of stuff to post up on the blog so we hope to be back to at least once a week. 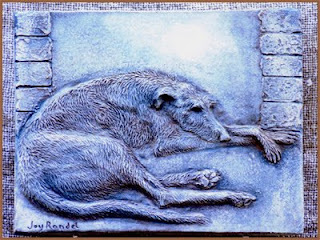 So let’s start with Joy Randel of Arizona’s little sculpted tiles - that’s them above - if you haven’t already viewed them and would like to see more, or if you wish to contact Joy or perhaps purchase one of her wonderful tiles - click on this link - Pata Tu to take you yo her website - view the gallery for a selection of her hound works of art. If you would like to see deerhounds in show this coming weekend - visit Alva for the Hound Association of Scotland Limited Show on Sunday, 11 July 2010, from 8am to 5pm at the Cochrane Hall. Tell them Rogue and Rascal sent you. And don’t forgot to enjoy a wee local tipple whilst you’re there. 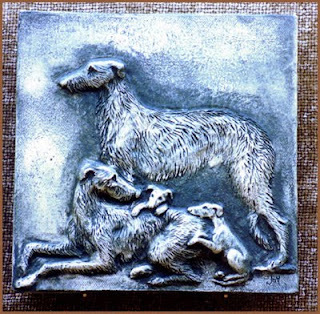 Hi there, the photos are now up from the film shoot at Stirling Castle on Friday and there are some shots of the dogs! Just go to the blog on my site and there's a link. As mentioned, feel free to use these for your site and contact me if you'd like some proper portraits of the big fellas. Cheers, Brian Vass.